The night started off with a very reluctant me (Aladdin was showing on TV! - Hemma will back me up on this) trudging out to catch a tram to go over to Dee's place. I was freezing cold, tired, and hoping that I wouldn't regret going out. 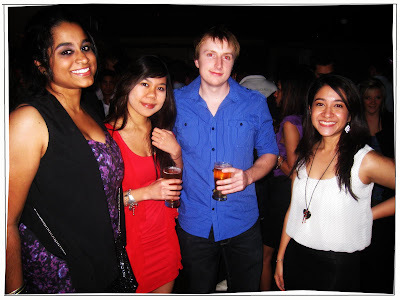 We were heading out to the Monash AXP, held at CQ Melbourne. It was going to be me, Dee, Hemma, Alya, and Chris. I got to Dee's (after a little traipsing about trying to find the place) and had a little dinner and chat before everyone started getting ready. The club was easy enough to get into - thank goodness! No long lines, except for the coat-check room. I won't even get in to that. Inside, it looked pretty darned good. Loads of space to get your groove on, bars, tiki torches burning in a semi-outdoor area, and an upstairs R&B room. Gorgeous place, horrible music. Horrible. But I was in good company. They were the only reason this night was so fun. But my sleepless exam nights soon caught up to me and I lost all will to dance and drink - LOL. So I settled with sitting down and chatting (really screaming) with the girls. 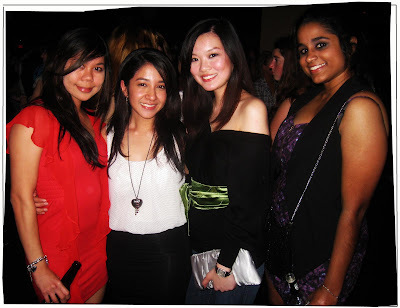 I miss hanging out with girls, talking the time away. It has a way of making you feel better, like you're not alone, and it's amazing to have someone empathize with you, or laugh along with you, or make you laugh. Thank you girls (and Chris) for the amazing night!